I don’t blog about food every day of the week. I know there are a few rare individuals out there that actually make a beautiful and photographic meal seven nights a week, but that will never happen here, unless I get fired from my job and with the luxury of 40 extra hours every week then I will have plenty of time to post amazing recipes and photographs every single day of the week. Until then you will see 2 or 3 food entries a week for the most part, sometimes more, sometimes less. I have to wait until the weekend to cook lavish and time consuming dishes for my crew (dessert included!). Now we do eat 7 days a week. Meals prepared by moi with the occasional Subway sandwich or pizza thrown in on any given Friday when I just need a break from the kitchen. Our weekday meals are usually quick and easy. Once a week we will have a pasta dish with varying accompaniments, veggies, beans, seafood, etc. We usually have chicken at least once a week too. I try to plan out all my meals for the week on Sunday so I’m not going crazy trying to decide what to have for dinner every night. We are a grilling family. We grill year round. Snow, sleet, rain, hail, oh well not so much hail, but we do use our grill 12 months out of the year. I cannot count the number of times John has had to brush the snow off the grill before he heats it up. Sometimes the weather will dictate what we eat. Last week when a heat wave came through we ate lots of salads and cold sandwiches, fruits and what little warm food we could tolerate was cooked on the grill. We also have a smoker, John’s favorite toy of 2007. There is nothing like the taste of meat cooked on the smoker. I love that smoker. Because of it; I have one less thing I have to tend too. I only have to worry about sides and desserts when there’s a hunk-o-meat smoking away. 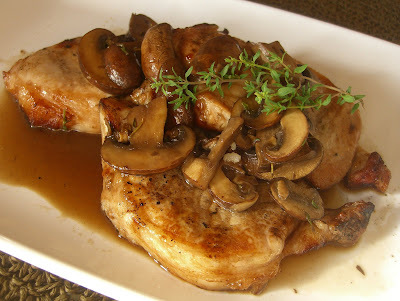 So the grilled pork with mushroom sauce is a typical weeknight dinner. I brined the pork the day before (always brine you pork, you will never eat un-brined pork again I swear) When I got home from work I started the mushroom sauce, John grilled, I made some the sauce and some rice and fresh greenbeans from the garden and dinner was on the table in less than a half hour. I brine my pork. It’s super easy to do and all you have to remember is to get it in the brine about 24 hours before you want to eat it. I used about a ½ gallon of cold water, ½ cup of kosher salt, ¼ cup sugar and 1 cup of boiling water. Mixed it all up and but the pork in the water and let them sit in the fridge overnight. This is just a simple brine, you can get all elaborate and add all sorts of spices and twigs and berries, but most of the time I use a simple one like this. While John was grilling the pork I started on the sauce. In a large pan I cooked the mushrooms in the little olive oil. As soon as they started to look like they were cooked about half way through I added in some white wine. No measurements here, I just poured it in until it just covered the mushrooms. I added in some fresh thyme and some salt & pepper. I let it simmered about 5 minutes and then poured it over my perfectly grilled pork. That brined pork was so moist and juicy. So here is an example of a weeknight dinner at my house. What did ya think I was gonna show ya Chef Boyardee? Tsk, tsk. Hey, I have never brined my pork, I have to try that. Thanks for the tip! This will probably never happen again.